At The Cole Law Firm, our mission is to help make our communities safer and help people overcome the many challenges associated with suffering a personal injury. We have exclusively focused on plaintiff's claims for more than a decade. In that time, we have held corporations accountable, changed unsafe practices and we have recovered countless significant awards on behalf of people who have experienced brain injuries, spinal cord injuries and other traumatic injuries. Additionally, our team represents clients in wrongful death claims. The founder of our law firm, Tobias A. Cole, was paralyzed from the neck down after a diving accident in 1990. As such, he has firsthand knowledge of the difficult circumstances surrounding a catastrophic injury, from paying for medical treatment to the emotional distress it causes. He relates to our clients on a personal level, truly empathizing with them as they go through the legal process. Prior to serving as an advocate for victims of negligence, Mr. Cole defended national companies against commercial personal injury claims. This insight into how the other side operates proves invaluable as he guides clients through settlement discussions and litigation. 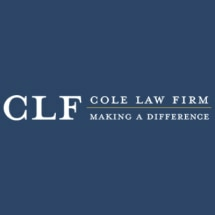 The Cole Law Firm offers free initial consultations.